Sorry that it has been so long since I have updated the blog, it has been a crazy spring for us. Everything seems to be going back to “normal” and we are moving forward full force with the “farm”. This spring I learned that the definition of a “farm”, according to the FSA is a property, regardless of size that can produce $1,000 worth of product. While $1,000 is not a lot of money these days it gives us something to work toward. It would be amazing if we could produce enough food for our family and $1,000 worth of food to sell. I am not sure that we will meet this goal this year, but we are working towards it in 2013. So far this spring we are almost ready to harvest a couple of pints of blueberries, and we have dried some parsley. We have lost a few crops to the chickens, who thought that raised beds make a great buffet. The chickens have put a hurting on my broccoli, cucumbers, carrots, parsnips and lettuce. It has been very tempting to make roast chicken for dinner but I remember I can get more meals from the eggs than the meat, so we have trying different types of fencing and coverings to protect our plants and extend the lives of the chickens. This spring we did not grow any strawberries on the property but we did go and pick some for jam. The strawberries this year seemed to be really watery; this made them very difficult to turn into jam. I canned 9 jars of the thickest jam I could make and it still is not worthy of a PB&J. So now what do I do with these 9 jars of unworthy jam? Our first solution was ice cream topping, it is wonderful, but I still wanted to do more with it. 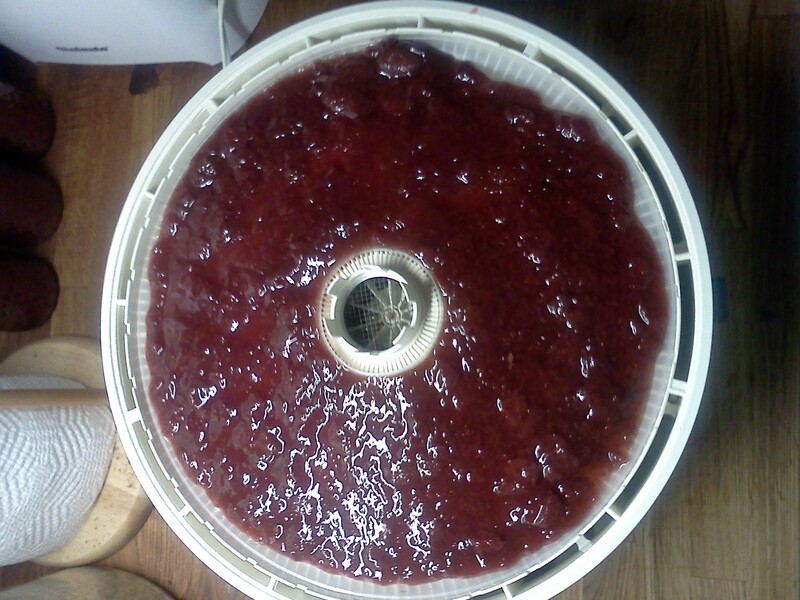 Yesterday while I was drying parsley I had the idea to make fruit leather out of my runny jam. It worked great!!! The dehydrator has a fruit leather tray. I set the dehydrator as low as it would go and went to bed. This morning I woke up to a wonderfully smelling house and the best fruit leather I have ever made. I think that the pectin helped the fruit leather to set up really nicely. I cut the fruit leather into strips and rolled it in some parchment paper. All natural, homemade, dye free, gluten-free, low sugar fruit roll ups. It is a wonderful option for jam that just did not jam. (Ice cream topping is another option). Enjoy those berries and remember to buy local this summer. Again, sorry there has been such a long break in postings, hopefully I will be able to get back to regular updates soon.